There are several steps involved in building a brand from the essence of an idea to the esteem of a known and trusted offering. Take a look at what’s involved. You can brand products, services, businesses, people, or personalities. The process starts by defining what you’re branding and whether your brand will be your one-and-only or one of several in your organization. Each brand needs to fill a unique, meaningful, and available spot in the marketplace and in the consumer’s mind. The promise you make and keep is the backbone of your brand and the basis of your reputation. How you present your brand can make or break your ability to develop consumer interest and credibility in your offering. Start with a great name and logo, and then launch communications that establish your brand, convey a compelling message, engage your audience, and foster the kind of two-way brand communication and interaction demanded by screen-connected and empowered consumers. This is the point in the branding cycle where too many brands lose steam. After brands are established, brand owners often begin to improvise with new looks, new messages, and even new brand personalities and promises. Just when consistency is most necessary in order to gain clarity and confidence in the marketplace, brands that lack persistence go off track. In a consumer’s mind — which is where brands live and thrive — a brand is a set of beliefs about what you offer, promise, and stand for. Great brands continually monitor brand perceptions to see that they’re in alignment with the brand owner’s aspirations and in synch with consumer wants and needs. 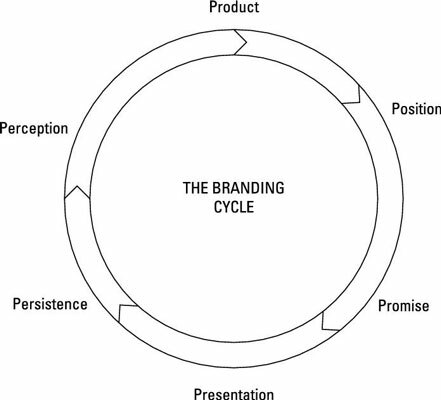 Based on the results of perception analysis, brand owners begin their loop around the branding cycle again, this time adjusting products, fine-tuning positioning statements, strengthening promises, updating presentations, rewriting brand-management rules, and, once again, monitoring perceptions in preparation for brand realignments and revitalizations.